MainAll NewsForeign AffairsIsrael, Bulgaria, to cooperate on technology and gas? 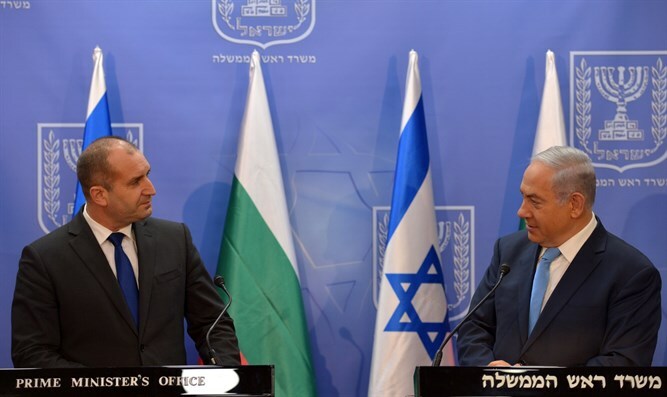 Israel, Bulgaria, to cooperate on technology and gas? PM Netanyahu and Bulgaria's Pres. Radev meet to discuss various economic issues, reinforce bilateral relations. Israeli Prime Minister Binyamin Netanyahu on Thursday met with Bulgarian President Rumen Radev. Speaking with Radev, Netanyahu said that Iran threatens not only the Middle East but the entire world. He added that Iran had to be prevented from acquiring nuclear weapons. The two leaders also discussed advancing bilateral cooperation in technology, innovation and trade. Netanyahu thanked Radev for the Holocaust commemoration in Bulgaria and said that he appreciated Radev's position in the struggle against anti-Semitism. "Mr. President, you have always been a staunch ally of the Jewish state and the Jewish people," Netanyahu said. "You've spoken eloquently and powerfully against anti-Semitism and you are welcome as a true friend, as is Bulgaria. We have a special relationship with Bulgaria – past, present and future." "We'll never forget that 75 years ago, the people of Bulgaria in Sofia stood up in an exemplary way against the Nazi demands for deportation: The clerics, the teachers, the intellectuals who came to the train station in Sofia. And I was always impressed by the telegram of the German representative to Berlin who said, explaining the failure of this deportation. "He said, 'The people of Bulgaria haven't developed enough.' And in fact, it showed the moral heights that Bulgaria reached in those days. And we know that there were dark periods in those horrible years. But we always remember what happened in Sofia as a testament of human morality and friendship to our people. "Today we have excellent relations and they are buttressed by Bulgarian Jews who came here, who form an integral human bridge between us. And equally, we have flourishing relations, which we work in many ways to cement and develop in this visit of yours in a variety of fields, all fields really. "That leads me to the future. You were yesterday in Be'er Sheva, you saw our cyber center. Israel is seizing the future, not only in matters of cyber security but in all matters of technology that will change our lives..... Reaching Mars, speaks about plumbing the depths of the earth and the human mind, and these are not fantasies – these are things that are happening. Israel is at the forefront of all this scientific research and technological know-how. We're eager to share it with our friends. You are our friends, we share with you the past, a vibrant present and unbelievable future." Radev thanked Netanyahu for his "warm words" about Bulgarian people and said, "I want to congratulate you with the 70th birthday of Israel, which is now nothing but an example for a modern state with functional institutions, vibrant democracy and vibrant civil society. We are together in commemorating the 75th anniversary on an unprecedented act of the rescue of Bulgarian Jewish population, which is nothing but a solid foundation to build upon our ties. This historically connected ties between our two peoples – this is nothing but a priceless capital, which we should care and develop." "We are deeply interested in following the Israeli example, to build a society that is both socially engaged and integrated. I mean basically the hi-tech, I mean the cyber security, and science and education. "Thank you very much that you opened before our delegation the gates of the Gav Yam technological park to look at the future. We saw with our own eyes on the spot the tremendous advantage of Israel in this area. It came to my mind that you are the founding father of this initiative and I congratulate you." Radev also expressed interest in diversifying resources and importing and passing natural gas through Bulgaria. Regarding security, Radev said, "We have good cooperation in the fight against terror. I would like to stress the important support we received from you after the terror act in Sarafovo in 2012. The tense situation in this world requires the security communities to cooperate with each other. And also our well-established ties in the sphere of defense." "My visit to Israel is also connected with participation in the 6th Global Forum to Combat Anti-Semitism, and this is in a world that the voice of hatred and xenophobia is rising up. I would like to confirm the firm position of Bulgaria of zero tolerance toward revisionism of history, and hatred and anti-Semitism." Radev ended by saying he would be "very glad" to discuss the various issues with Netanyahu and "seek steps forward" for the two countries.